Are you searching for a midcentury drainboard sink for your kitchen, but are tight on space and need something that will fit? 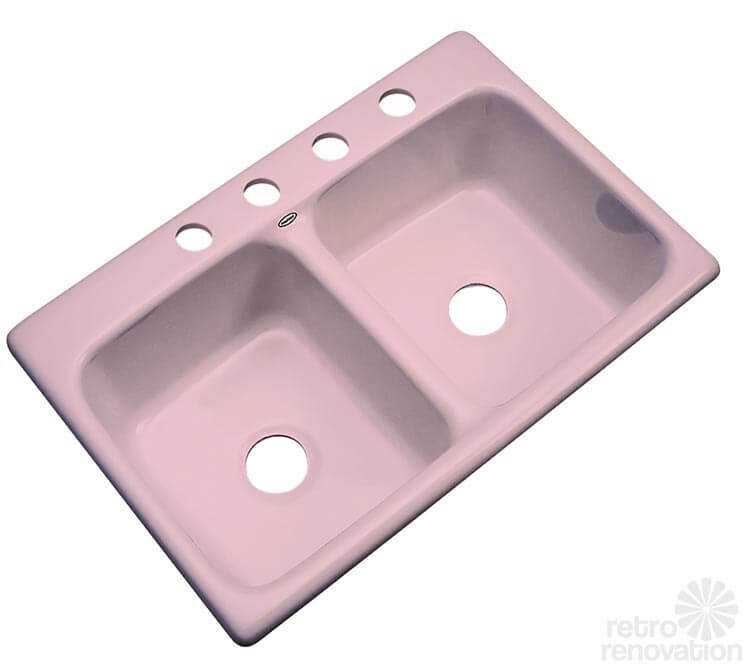 Nelsons Bathtub Inc. has released a third, smaller drainboard sink model in their line of reproduction midcentury style kitchen drainboard sinks. The sink measures in at 42″ long by 24″ wide, is available in your choice of six colors and costs between $680 and $710 with free shipping. A beautiful reproduction of a classic 1955 drainboard kitchen sink. Manufactured from reinforced premium grade Bio-Lok™ cast acrylic, this reproduction combines durability, ease of care, and authentic vintage styling. Quality assured with a 5 year manufacturers limited warranty and your satisfaction guaranteed or your money back per our 30 day return policy. Left side features a drainboard while the right has a single basin for washing. Molded in soap dish left of the faucet location. Faucet holes are drilled on 8″centers. Drain hole measures 3.5″ in diameter. Overall dimensions: 42″ L (side to side) x 24″ W (front to back) x 5″ H (from bottom flange to the top of back splash) 11.5″ from bottom of sink basin to top of back splash. In all, Nelson’s has five reproduction drainboard sink models. 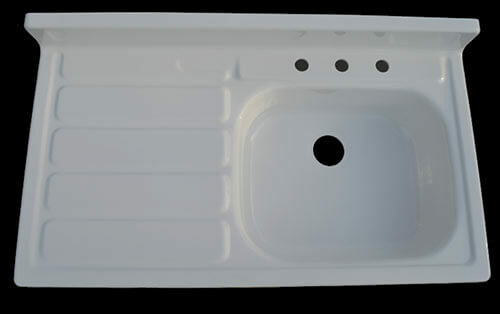 If you are wondering about the durability of NBI Drainboard Sinks, the company has added two short videos — that show how the sinks hold up to boiling water, hot pots and even a hammer — to their homepage to tout the toughness of their cast acrylic sinks. Reproduction 1940s-1950s farmhouse drainboard sink now available from Nelson Bath Tub, Inc.
Read our complete page about Farmhouse Drainboard Sinks here. Disclosure: Nelson’s is currently an advertiser here, but this story is not part of “the deal.” We just want to keep you informed of the latest and greatest in midcentury home renovation products – no matter what the source! Lovely design, but terrible color selection. I think that, as we have seen before with retro revivals and reproductions, the manufacturer must appeal to the broader, mainstream market as well. I am grateful for the white! I think they would be surprised if they offered one or two color options. *shakes head* Too bad though, right? Maybe I should have my sister save her butter yellow drainboard. It needs to be re-porcelained (is that a thing?). You guys actually helped her out with what you called “a mini-martini house” in Fairbanks, AK. also they don’t seem to offer it with the drainboard on the right? The color choices are rather… er, uh, bland, but if someone wanted another color, can’t they be recoated? I mean, I’ve seen that done on those home redo shows, right? I think the bones of these sinks are really cool. See our story about re-porcelaining an old steel sink. Requires an expert and is expensive. Any other method — for a kitchen sink — would not be long-lasting, I suspect. I know the folks at Nelson’s know we want color – we’ll ask them if it’s in the cards…. Hey Pam, thought I would chime in on the discussion of color and/or the lack of it. I more than anyone would love to be able to offer color selections that included Robins Egg Blue, Mint green, Buttercup Yellow, Flamingo Pink, and so on, but unfortunately the manufactures of the particular cast acrylic (not all acrylic is suitable) that we incorporate into our products is offered only in smaller quantities (if you can consider a ton to be smaller) of what is considered “standard colors”. 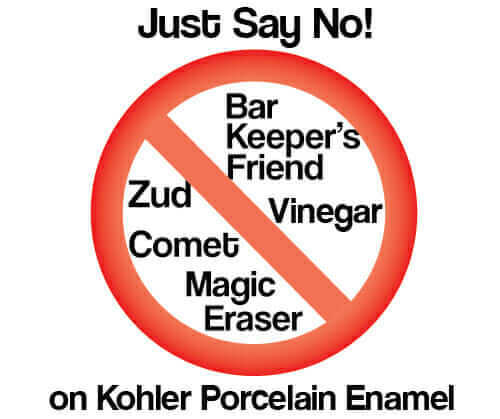 The much larger quantities required by the manufacturer to get the “custom colors” that I mentioned above would be prohibitive at this time based on our current consumer demands for them. I am however very persistent in my searches to fill this color selection void and if there is a viable option to be had, I am hopeful that we will find it. Thanks, Kent, for that clarification. Everyone, to clarify: Kent is the owner of NBI Drainboards Inc. aka Nelson’s — makers of these sinks. I know it’s been a real labor of love on his part. If I had a kitchen to renovate again — I’d be all over one of these sinks! Thanks, Kent! Okay, I dig what Kent is saying. Really, the more I think about it, the current colors could be like “white space”–you know, like if your counter top or back splash is chock full of color, the sink could be a spot where the eye would “rest”. Like, if any grout would be either off white or gray, the sink color could match–or vice versa. Personally, I think a black sink on a butcher block counter top would be way awesome. Butter yellow surrounding a gray sink would be cool, too. We have the Youngstown metal cabinets that we refurbished and we purchased an ice gray drainboard sink that is absolutely beautiful! It fit the cabinet perfectly and we couldn’t be happier! OH WOW – this is the perfect size for me. Galley kitchen owners – rejoice! 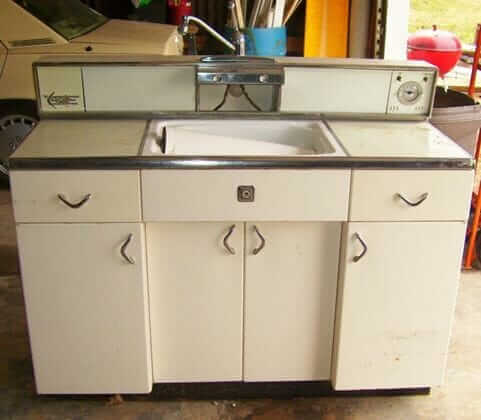 Vintage sinks in this size are SO hard to find. Have to agree with the others, having some “real colors” to choose from would be nice, but heck, it’s a nice alternative to stainless, and it’s better than only beige! A dishmaster will dress one of these up nicely. Does anyone have one of these sinks yet? I’m hoping this would be a more “forgiving” surface than cast. I do all my dishes by hand, and have a lot of vintage glass/dishes, so avoiding breakage is a high priority for me. Yes Mark, the surface of the NBI sink that is extremely forgiving. I hand wash most, if not all of our dishes. I use my china, handed down from my Grammy daily. No chips or dings on the china or the sink. The depth of the sink helps too. It isn’t so deep or wide that things rattle around in there. I just today installed a double sink/drainboard from NBI and I absolutely adore it! Get over the color, this sink is amazing in white. I could not be more pleased with this sink. Every since I saw a vintage drainboard sink in 1926 circa home I’ve wanted one. I could not image installing this had it been cast iron. The sink was easy for the plumber to handle and the finish as absolutely lovely. I would recommend NBI drainboard sinks to anyone. 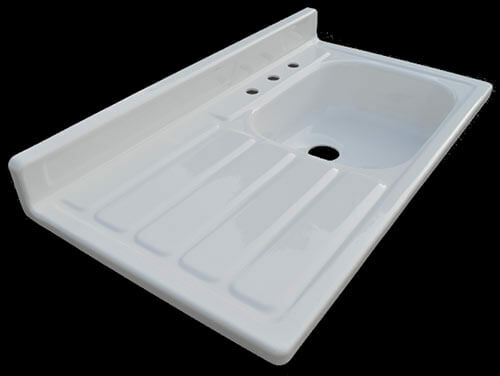 I love our white double drainboard sink from NBI. We just built our new home and the centerpiece of our beautiful kitchen is our sink. It is gorgeous and sturdy. I love to cook, a lot and I have filled this sink with dirty pots, cast iron pans and the like day in and day out. All I need to do to the sink after I clean the pots and pans is give it a quick swish with my Dishmaster 2000 Brush and a spray of soap. Then it gets a quick wipe with a dry, clean cloth. Its gloss is beautiful. I have no doubt it will stand the test of time.